Matt Coleman is originally from Amityville, New York, but has recently moved to New York City to build his Musical Career Early on he was inspired by music through intrigue of its persuasion of emotion because some times out of curiosity he would wonder how come this song makes me cry or happy and why listen to it and how come music is so therapeutic. Many events lead him to music early on as a way to escape bad feelings to good feelings or cope with loss of loved ones by escaping from his situation by reminiscing good thoughts. As of today it keeps me focused and positive to strive for excellence . The following was written by Matt Coleman. I choose to do this and will succeed at doing this and hope my music can share pieces of my life to help others understand me better through being passionate with my songs. My favorite artists are Vanessa Carlton mainly her “Be Not Nobody” album songs, mainly to this day helps me cope for it is the first songs i used to relax with and cope with death and through trials and tribulations of mine in it brings back memories of when i graduated high school and went to college to better my life . The second is Cassidy; I’m a huge fan of his business sense; on how he takes situations in, capitalize on them and my cousins’ Lil Group. He was the first to help me lay a hook, first song in understanding of business aspect in a lil of the music industry. 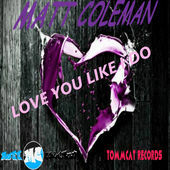 Matt coleman’s song ” Love You Like I Do ” , caught the attention of Tommcat Records label owner Simone Beckett. Matt’s song will be going out to 5,000 radio stations worldwide, worldwide distibution with up to 700 digital stores and ongoing promotion and publicity to advance his career. Please feel free to contact Matt, sign up for a newsletter, buy a track or post a link to this site on Facebook, Twitter or other site with your good news about him.